The area of skin supplied by one spinal nerve is called a dermatome. A spinal nerve also supplies muscles that are derived from one myotome. A myotome is the dorsal part of each somite in a vertebrate embryo, giving rise to the skeletal musculature. Partly from segments T12 and S4. Each spinal nerve is formed by a combination of anterior and posterior roots for that particular spinal segment. The posterior or dorsal root is the sensory root of a spinal nerve and the anterior or ventral root is motor nerve. After it leaves vertebral column, spinal nerve divides into dorsal or posterior ramus, ventral or anterior ramus, and rami communicantes, each carrying both sensory and motor information. The rami communicantes contain autonomic nerves carrying visceral motor and sensory information to and from the visceral organs. 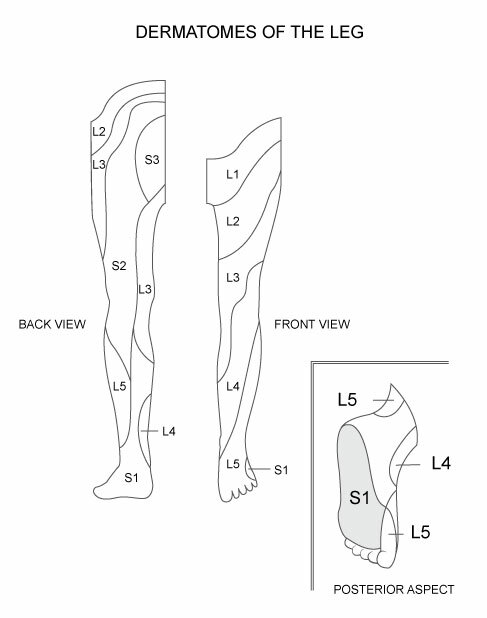 The dermatomes of the lower limb are described in the diagram below. As the rule, the limb is supplied only by anterior primary rami. The exception to this rule is that the skin of the superomedial quadrant of the gluteal region is supplied by the posterior primary rami of nerves L1, 2,3 and S1, 2,3. There is a varying degree of overlap of adjoining dermatomes so that the area of sensory loss following to the spinal cord or nerve roots is always less than the actual area of the dermatome. Initially, each lower limb bud has a cephalic border and a caudal border. These are known as the preaxial and the postaxial borders, respectively. In the embryo, the great toe and tibia lie along the preaxial border and little toe and fibula along the postaxial border. Later on, the limb bud rotates medially so that the great toe and tibia are carried medially, and the little toe and fibula laterally. Thus, the tibial border is the original preaxial border, and the fibular border, the postaxial border, of the lower limb. Along the preaxial border from above downwards, these are dermatomes T12, L1, 2,3 and 4. The middle three toes, the adjoining area of the dorsum of the foot and the lateral side of the leg are supplied by segment L5. Along the postaxial border from below upwards, there are dermatomes S1, 2,3. As the limb elongates, the central dermatomes (L4, 5, S1) get pulled in such a way that these are represented only in the distal part of the limb, and are buried proximally. The line along which the central dermatomes are buried is known as the axial line. In fact, an axial line is defined as a line along which certain dermatomes are buried (missing) so that distant dermatomes adjoin each other. Overlapping of the dermatomes is minimal across the axial line. There are two axial lines, one ventral and one dorsal, both of which extend largely on the back of the limb. On the posterior surface of the limb, the ventral axial line extends up to the heel, whereas the dorsal axial line ends at a higher level, at the junction of the upper two-thirds and lower one-third of the leg. One the anterior surface of the limb, the ventral axial line crosses the scrotum, and the dorsal axial line encroaches on the lateral side of the knee. Some authors maintain that the dorsal axial line does not exist. A spinal nerve supplies muscles that are derived from one myotome. A myotome is the dorsal part of each somite in a vertebrate embryo, giving rise to the skeletal musculature. Most of the muscles are supplied by more than one segment of the spinal cord but the supply by some segments is more prominent. Damage of the predominant segments results in maximum paralysis of the muscle. However, there is considerable controversy regarding the segmental innervations of muscles but here is a rough guide. Psoas major, iliacus, sartorius, gracilis, pectineus, adductor longus, adductor brevis. Quadriceps, adductor (longus, brevis, magnus). Quadriceps, tensor fasciae latae, adductor mangus, obturator exturnus, tibialis anterior, tibialis anterior, tibialis posterior. Gluteus medius, gluteus minimus, obturator internus, semimembranosus, semitendinosus, extensor hallucis longus, extensor digiotorum longus, peroneus tertius, popliteus. Gluteus maximus, obturator internus, piriformis, biceps femoris, semitendinosus, gastrocnemius, soleus, peronei, extensor digitorum brevis. The segmental innervations of muscle can also be expressed in terms of the movements of the joints. Sympathetic innervations of the lower limb is derived from the lower three thoracic and upper two lumbar (T10 to L2) segments of the spinal cord. The fibers arise from the lateral horn cells and pass out with ventral roots as preganglionic ( white rami) fibers. These pass down the sympathetic chain to relay in the lumbar and upper 2 or 3 sacral ganglia. The postganglionic ( grey rami) fibers emerge from the lumbar sympathetic ganglia and pass through grey rami to reach the lumbar nerves. From these nerves, they pass into the femoral nerve. Some postganglionic sympathetic fibers emerge from the upper 2 or 3 sacral ganglia. They travel through the tibial nerve to supply the popliteal artery and its branches in the leg and foot. The blood vessels to skeletal muscles are dilated by sympathetic activity. These nerves are vasomotor, sudomotor and pilomotor to the skin. Knowledge of dermatomal distribution and myotomal supply help to assess the spinal lesions to ascertain the levels of insult.